Kanesville Elementary students Sophia and Sabrina Johnson's dad Jeremy is a big Miami Dolphins fan. So when the sisters saw a news story about a Tayton Timothy, the little girl from Delta who had been injured in an accident, they noticed that she was wearing a Miami Dolphins jersey in her photo. The sisters thought that they would like to send Tayton a care package to buoy her spirits and help speed her recovery. When Principal Scott Zellmer learned of the girls' plan, he suggested that the school do a mini fundraiser to purchase Dolphins gear for Tayton. Little did he know that his little fundraiser was about to snowball into a huge outpouring of love and support from the Kanesville community to a little girl whom they had never met. The students began selling paper dolphins for $1.00. 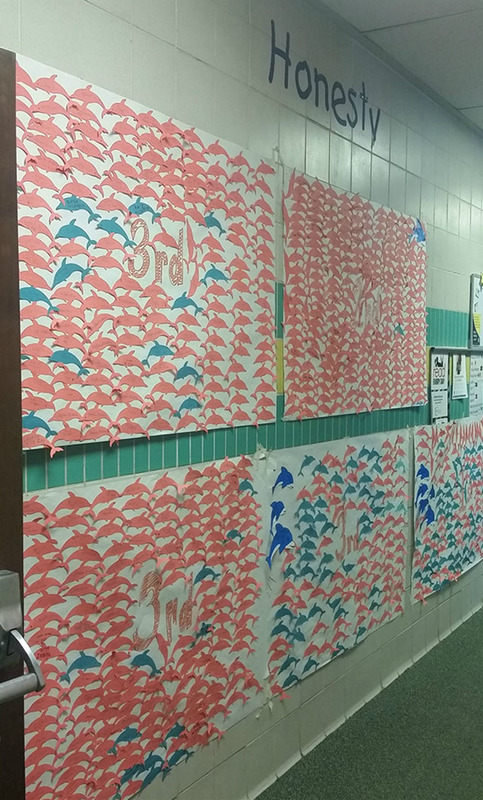 Kids were able to sign their names on the dolphins and hang them up in the halls. Alicia Johnson-Coats, an ESL Aide at Kanesville, stated that kids were literally emptying out their piggy banks to buy dolphins for Tayton. Within three days' time, students had raised an astounding $4,200 to help defray mounting medical bills and travel expenses. With the help of Mrs. Johnson-Coats, students put together a video presentation to send to the hospital. When Tayton's family received the video and learned of the effort at Kanesville, they decided to pay a visit for themselves. Mr. Zellmer called an assembly, and along with his student body, presented Sammi Timothy (Tayton's mother) with the money that had been raised. Sammi tearfully thanked the students for their love and support, and stated that Tayton was well on her way to recovery. She was grateful for the joy they had given her daughter, who as of last night, was able to watch movies and laugh with her family. Sophia Johnson's teacher, Stacy Rountree, states that she is not surprised at the lengths the two sisters went to in order to help a stranger. She said that she has witnessed many instances where Sophia has shown kindness towards her peers, and has even anonymously helped other students in need. 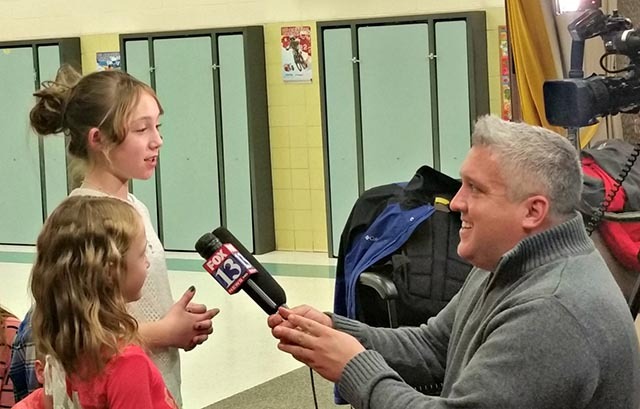 Sophia and Sabrina, along with the Kanesville Student Council, worked tirelessly to help raise money for a child who began as a stranger, and is now a friend to the entire student body at Kanesville Elementary. In today's assembly, Sammi promised the students that Tayton will make a personal visit to thank them when her health allows.